How do you place it? I understand from my reading that the standard treatment for Stage I seminoma (after orchidectomy) is radiotherapy to the para-aortic (retroperitoneal) nodes of the abdomen. Given the spread of volume based planning I am trying to determine what volumes I should contour for a seminoma treatment. When the surgeons do a retroperitoneal dissection they only take tissue out below the renal arteries; with radiotherapy the field is extended a significant distance above this. Is there a good reference that discusses the rationale for placing the fields as we do? Thanks for joining the Isocentre community. It is a pleasure to have people from all parts of the world interacting on a topic. Actually this is a bias that comes from the old lymphangiogram based studies. Infact the same thing was done for Cervix and HD (and my assumption is this is where the fields came from) - remember in those times there was no really reliable way of knowing if there is a node sitting at the L1 level. Having said that there is actually little data on weather you really need to treat the high preaortic nodes in stage I seminoma - i mean objective surgical data. We have data on patients relapsing after surveillance too (for example see this http://www.ncbi.nlm.nih.gov/pmc/articles/PMC1977398/pdf/brjcancer00069-0145.pdf) - but they really dont mention anything about the high or low failure. Lengele's Paper gives an idea of the extent of nodal CTV which we need to draw "anatomically" - its available here Lengelé B, Nyssen-behets C, Scalliet P. Anatomical bases for the radiological delineation of lymph node areas. Upper limbs, chest and abdomen. Radiotherapy and Oncology. 2007 Sep;84(3):335-347. Personally what I would do ? a) why the 7mm expansion - isn't this too conservative for the paraaortic region? Is there any evidence that most nodes are covered within this expansion in this anatomical region? In Lengele's paper the areas contoured in this region look more generous. Table 4 suggests that for testicular lymphatics we need to cover the area ant to the psoas. for 20Gy I would not cut corners on the volumes. b) if we are going to take an anatomical approach to the superior margin, then we must remember that on the left side the testicular lymphatics are likely to follow the renal lymphatics (where the renal vein joins the IVC at the L1 level). So what I would do is give a safe superior margin of 1.5 - 2 cm above the junction of the LRV and IVC and then take whatever PTV margins (depending on the institutions daily setup and image-guidance policies). This may take the superior margin above T12 sup border sometimes. I would not 'primarily' base the CTV on the vertebral level. Hi Indranil the 7 mm expansion is an artefact of the Taylor's paper. You are right about the margin may be a little on the conservative side and may need expansions somewhere particularly in the region of the left renal vein. No evidence but 7 mm usually brings the CTV right into the intestine anteriorly from what I have seen. However a cm is unlikely to be much different. About the top level the way you are saying is a good method. I just cited the method to make the border match with the "standard" PAN field. Thanks for the post Andrew, Santam has already given a very detailed reply to your querry. I suspect that there are a number of areas where our fields were both generous and skimping. When I have volumed para-aortics for seminoma in the past, I have ALWAYS seen that the fields were LARGER than the conventional fields. In relation to upper field, I agree with Leinna in not understanding why irradiate an area that was never excised under the same conditions. Level 5 in H&N has something of the same fate. I have never used the [vessel + 7mm + muscle/bone trim] for nodal delineation anywhere. It's just not that onerous to delineate the nodal areas in the pelvis from what you see. Good points there. So how do you actually delineate the the retroperitoneal nodal CTV. the reason I am asking you while anteriorly to the vessel you can use the bowel loops to restrict your contour what do you do laterally to the vessels. And how do you contour the nodal CTV in pelvis for that matter. Can you give us some pics? 1) Lymphatics extend from T11 to L4 but are concentrated at Renal Hila due to common embryological origin. Primary landing site for right side is inter-aortocaval area at right hilum; for left side it is peri-aortic area at left hilum. 2) Invasion of epididymis and spermatic cord spreads to distal external iliac and obturator nodes. Scrotal violation leads to inguinal metastasis. The important clinical aspect of spermatocytic seminoma is that once orchiectomy has been done, it is curative. Anaplastic variant presents in higher stage; but not a worse prognosis. 4) A negative FDG-PET alone has value in exclusion of the disease. 5) Stage I seminoma has 20% risk of occult disease. 6) Stage I includes all T sub stages; is node negative and barring IS, with negative serum markers. 7) Current recommendations have pooled in heterogeneous patients with mixed up histologies. 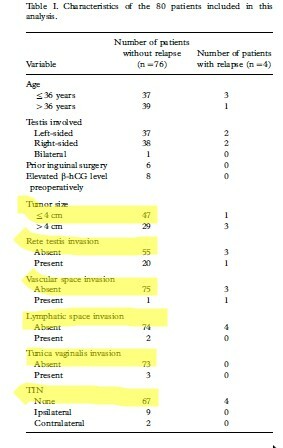 8) High risk factors include T > 4 cm and rete testis invasion. After considering these facts, it becomes easy to analyze the existing data and the evidence cited. I would only argue against the field reduction because if you look closely, bulk of patients had T<4 cm and there were no adverse factors in majority of them. Hence it becomes imperative to consider the paper in the light of above evidence. Long term results of irradiation (In the complete paper, they also have patients segregated by histology). Based on the Radiation Therapy Oncology Group scoring criteria, acute toxicity was limited to grade I gastrointestinal (GI) toxicity in 25 patients (35%) and grade II GI toxicity in 7 patients (10%). Acute toxicity was not recorded in 4 patients (5%). The most frequent acute toxicities were nausea and vomiting (30 patients; 94%). Diarrhea occurred in 3 patients (10%) and epigastric discomfort in 1 patient (3%). These symptoms were self-limiting or well controlled with medication. At the time of this report, no late toxicity has been observed. There is no reported peptic ulcer disease or second malignancies within the treatment field. The primary target coverage was dosimetric coverage of inferior vena cava and aorta (as mentioned in the lymph node spread). A 1.4cm expansion was generated in the anterior, lateral, inferior and superior directions around the combined aorta and IVC volume, and similarly for the renal vein except for no expansion laterally. A further 1cm expansion was added to generate the field margins. One more question. Has any consideration been given to the pulsation of the vessels? Hence, I would strongly suggest that field reduction should not be done given the risk of possible sparing of the disease. Current literature recommends 1.25 Gy per # and almost minimal long term outcomes. Only and only if the pathology is favorable, should the field reduction be attempted (which means that you should have a blind faith in your pathologist). I would guess that the abdominal vessels don't pulsate too much as I have never seen artefact due to their movement (compared to lung/heart movement). But I don't have any good data on this. The real question is why are we taking the field so high when even for NSGCT RPLND as everyone is pointing out no one goes that high up. Infact taking the borders up at T10-T11 is actually going inside the thorax. While you may argue that RT in seminoma testis does not lead to significant amounts of toxicity for the dose levels we are giving it is understood that the risk of 2nd cancer and heart problems are related to field size. Infact if you go through the swedish paper we had up as the JC you will be struck by the large number of people dying of cardiac causes after treatment by RT (ofcourse they had age and other factors to consider rather than just RT alone). So just from the basis of ALARA reducing the fields where we know we can safely makes a lot of sense. Secondary cancers are perhaps an overblown issue. I do differ on this count because there are a number of studies which are "inconclusive". We conducted an outcome and complications analysis of patients treated with adjuvant radiotherapy (RT) for early-stage testicular seminoma over a 35-year period at the University of Florida. Median RT dose to PAN and pelvic fields was 25 Gy. Local control and cause-specific survival at 20 years were 95% and 96%, respectively. Of the 3 recurrences, 1 was salvaged with chemotherapy. Subset analysis of 41 patients revealed 1 patient who developed peptic ulcer disease and 11 patients with gastrointestinal reflux symptoms after RT. Thirty-two patients fathered a child before or after RT. Cardiovascular complications were not greater in those treated with prophylactic RT to the mediastinal region. The rate of nontesticular second malignancy for the overall group was 8% at 15 years. Treatment-unrelated factors - possibly genetic predisposition - must be considered for a substantial number of these second tumors, since in the present study the follow-up was rather short and most of the second cancers were located outside of the radiation fields. When the dose by itself has been reduced to 20-25 Gy, how can it lead to "cardiovascular mortality"? It's the idea that I have argued for "reducing the margin"; unless one is very sure of eliminating the set up errors completely. I don't have access to the complete articles and I have quoted the relevant abstracts only. Hi Abhishek again no one can dispute your assertion that the risk is small. And as you rightly point out this study does point out to the fact that the outcome of seminoma patients treated with RT is excellent (which is why it is the gold standard actually). http://jco.ascopubs.org/content/22/4/640.full#R12 - This paper analysed the mortality trends in patients of seminoma testis and compared it with age matched cohort. The main conclusion of the study is simple and something know to all oncologists who have been treating Seminomas over their careers. Patients die of other causes and cardiac disease and cancer are on the top of the list. Now you can argue that these two causes will kill most of the healthy american population too and thats why the authors included a comparision with age matched cohort from the population. Patients who had not received Mediastinal Irradiation and those who were cured had a excess relative risk of 1.44 ( 95% CI 1.12 - 1.83) of dying as compared to the age matched cohort. Another interesting finding the RR of death in the cohort not receiving mediastinal irradiation with a follow up of < 15 years was 1.08 (95% CI 0.79 - 1.59) while for those with > 15 years follow up it was 1.55 (95% CI 1.12 to 2.09). Thus follow up less than 15 years actually underreflects the excess mortality. However there are methodological issues with paper particularly the way the comparision cohort data is drawn. http://jco.ascopubs.org/content/21/8/1513.full - Another very interesting study evaluating cardiovascular morbidity post radiation. Most of this cohort had received no mediastinal RT (92%). However even after adjusting for age patients on surveillance had a significantly lower risk of cardiovascular events. What is of interest is in this paper they have included the data on the dose that the heart received - the mean maximum dose was only 3.36 Gy. An average of 14% (range, 8% to 45%) of cardiac volume received a dose of 0.9 Gy or more. SO why this increased risk ? - some postulate it may be secondary to the effect of RT on renal artery actually. The authors have clearly acknowledged this in the well written discussion AND advocated reducing the field borders down from T10. However results from one of the largest studies from the swedish group are contrary to this finding. http://jco.ascopubs.org/content/24/3/467.full In this study no excess of cardiovascular events were found after a median follow up of 18 years when compared to population based mortality for seminoma patients treated with RT. Infradiaphragmatic RT was primarily used. So my conclusion after reading this study is despite the low doses of RT there is an increased risk of Cardiovascular morbidity in patients with stage I seminoma treated with RT ( the magnitude is probably small much less than what the first two studies tell us if patients receive adequate information and support for maintaing a good life style). Patients treated with CCT have a higher risk of cardiovascular events actually but that is a point thats different from this discussion topic. So you see in patients with the poor prognostic factors the incidence of relapse changes but the site of relapse doesnot. As most relapses in these patients occured in the presence of the poor prognostic factors named above. there is no good reason based on data or anatomical logic to justify treatment fields up to T10/T11 or T11/T12 intervertebral disc spaces (this dual option makes me immediately suspicious - in the lower abdomen it is at least resolved by being able to see where the aorta bifurcates, but there is no such landmark in the upper abdomen. there is insubstantial risk associated with the technique, and so why change it? In answer to the above, my response is that the Justification for RT involves a 'professional contract' that I will use a dose deposition pattern of a size and intensity that is what is required to cure the patient. This is the basis of the on-going field size reduction from 'dogleg' to PA field. This is the basis of the on-going dose reduction from 30Gy to 20Gy. In fact the widespread pattern has been to escalate dose and tailor field size until highly reproducible cures are observed (e.g., H&N, lung, prostate). And to reduce dose and tailor field size when highly reproducible cures are observed (e.g., seminoma, Childhood tumours). Personally I think there is an excellent rationale for anatomically based voluming that minimises field sizes. The target areas should be para-aortic nodes bilaterally and R perirenal nodes (?below the renal vessel). This should be expanded by movement (?1cm) and then approached with 2-4 fields. However from what I can see so far is that the surgeons dissect laterally quite a distance (usually to the ureters) which is about the lateral extent of the transverse processes - therefore is using those transverse processes as a field edge inadequate ?? Thanks for the paper links Santam. Here are several methodological flaws in the cited papers vis a vis cardiovascular events (that is the main point of discussion). 1) Retrospective series from MDAC has included patients from 1951-1999; a huge time gap where the standard of care has undergone a marked change. For example, 31 men received whole-abdominal radiotherapy, and, before 1971, most men had prophylactic mediastinal radiotherapy—a significant risk factor for long-term toxicity in this and other analyses. It is notable that the most common second cancer in the MDACC report was lung cancer. If you look around, the standard practice from MDACC, patients with bulky abdominal metastases as large as 10 cm in diameter have been treated with large radiation fields; where you would argue for chemotherapy in this group of patients. You would also agree that retrospective studies have an inherent bias and you would not give them "any importance" in terms of "evidence care medicine". 2)The Second quoted paper suffers from similar flaws in it's assumptions. Basically it is a compiled questionnaire. Angina-like chest pain is sometimes noncardiac in origin;to differentiate chest pain of cardiac versus noncardiac origin is impossible on the basis of history alone and up to 30% of patients presenting with such features have normal coronary arteries on angiography. The prognosis of such patients (who are often young) is good. There is often an added level of anxiety. I am not arguing about the pattern of relapse. I am only insisting that reducing the vertebral level would not affect the heart or have any long term consequences. I would still insist that present classical boundaries be respected; the cited papers need to be weighed in with respect to current standard practises and fractionation schedules and to weigh in best evidence. For a favorable prognostic disease i.e. T<4 cm and WITHOUT the rete testis invasion/negative FDG PET for nodal disease would I venture for T12. which in essence would mean 84% of the population with stage I seminoma in western hemispheres (not in india where people come with oranges in scrotum pineapple in abdomen and berries in groin). Actually Andrew and Indranil nailed it in the head when they said there is no logical reason why a vertebra should be the limit for a CTV when the CTV is supposed to cover the lymphatics. I'd agree with you with the "physiological spread" to be criteria alone but I'd rather stick with the huge amount of evidence existing. If done within the ambit of a clinical trial, there is no issue. The discussion has not been about changing routine practice, although the BEST results will come from dogleg and mediastinal RT (so why not use that???). The large amount of evidence has all been developed to answer one issue - how do we minimise the treatment portals and doses. Which is the substance of the discussion here. Perhaps we need to ask questions about this in international meetings, and when we talk to our trainees who will advance the science after we are gone, and so need new ideas to follow up on. While I agree that we can restrict the superior border to around T12 (since we don't have a reliable and practical way of visualising lymphatics to ensure it's coverage - I'll stick on to referring to a vertebra), we need not increase the CTV in the lower portion. JNCI J Natl Cancer Inst (2011) 103 (3): 241-249. This article published recently,analysing 2476 patients treated with RT says that "An abdominal site of relapse was rare in patients treated with para-aortic or dogleg radiation therapy". - with the standard fields. So why should we increase the CTV lower down ? Now we also have an equally compelling option of carboplatin - http://jco.ascopubs.org/cgi/doi/10.1200/JCO.2009.26.4655. The advantage that they mention of carboplatin is that it reduces C/L GCTs (we don't have an answer for that) and the disadvantage of RT as increased cardio vascular events. (The article from MDACC - with 71 patients receiving mediastinal radiation, and in PA radiation - upper border at top of T10 and 194 of the 502 patients treated prior to 1980—— I personally feel that publication of such old outdated data does more harm to our community than benefit.) The said study with a median followup of 6.5 yrs (though short) does not report any excess death in radiotherapy arm !. Its an exquisitely radiosensitive disease so I suspect much lower doses are actually sufficient (I am explaining my theory below). Relapse is rare with stage I seminoma only seen in 20% or so of the overall stage I patients. That means marginal miss or no marginal miss only 20 out of 100 will actually come out with a retroperitoneal failure if you miss them. On the top of this most of the periaortic nodes are actually situated a lot closer to the vessel as I remember from the dissections. They literally hug the artery. Being small and close to the artery I suspect even with narrow fields they lie inside the 50% isodose coverage at least. So a small volume exquisitely radiosensitive disease how many patients do you actually need to treat before you land up sufficient marginal recurrence? About 3 - 2 % of seminoma patients go on to develop 2nd GCTs. The 95% CI for the patients with seminoma aged < 30 years was 2.4 - 4.0%. . Essentially what we are seeing in Olivers trial is the lower end of this 95% CI which makes me suspicious that the patients were probably at a lower risk of developing SGCTs. Furthermore its mentioned in the article that pretreatment FSH was a significant predictor of the risk of a SGCT but I cant find in the articles weather the FSH levels were distributed equally in the two groups (or in the previous one in Lancet for that matter). 10 relapses in pelvic field, 3 in paraortic = 13 subdiaphragmatic relapse. Percent of patients with relapse 4.1% (37 / 904). if there were no pelvic relapses then relapse rate would have been 3% which compared to 5% rate of relapse in carboplatin may have made the curves separate out nicely. What were the location of the abdominal nodes wrt the portals - what if they were marginal? relapse rate would have been reduced to 2.6% which is about half of the rate for the carboplatin. The trial had a non inferiority criteria that it would detect a doubling of the relapse rate at 2 years with a 90% confidence (not 95% mind you which makes the trial underpowered still). 2.6% vs 5% ?? - isnt that a near doubling? BTW all the three trials reveiwed in the paper you mentioned were conducted in the 80s and early 90s essentially the 2nd generation studies after the ones we discussed earlie. The paraortic failure was around 15 -20% of all relapses actually - not a very inconsequential number since we dont have the data of these relapses weather they were infield or marginal.